On Monday afternoon a Swarm of Bees landed in our garden. I knew that with a Nosy little dog this was a disaster waiting to happen so I called a local bee keeper who said he could come to collect the swarm the next morning, for a small fee. The next three pictures are from that first afternoon, the bees had formed a large loose U shape on the fence and were congregating under the top rail, while a cluster at the bottom of the U were pulling in a part of the Rose bush they were behind. The next morning when I went out to check on them this is what sat where that lower cluster had been and the majority of the remaining bees were now down at the base of the fence and behind the bottom rail. There were a few up at the top pulling in the plant as the group down lower had been the previous day. Isn't the pendulum of bees amazing! 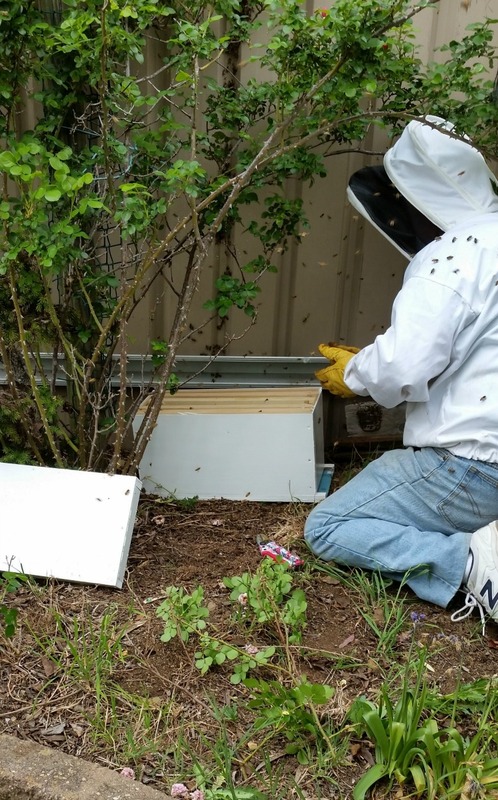 The man came with his box and communicated so nicely with me about the process, he patiently answered all of my questions about the fate of the bees. He said once they settle in that box they will be offered to a beginner who wants to start keeping bees, through the bee keepers association. He did tell me at the start he would not be able to get every single bee in there and estimated about 1% of the swarm would be left behind. He gave me a protective hood thing ( I don't know the correct term ) and let me watch the entire process. With no Queen, no purpose and drastically diminished supply of honey, the ones left behind are dying. Its sad watching them trying to fly and seeing that their energy levels are so low they just can't make it. They wait so faithfully there looking for her. I took this pic earlier this morning and now that it has warmed up most of them have made it back up onto the fence. The ants are moving in on the others. Tammy, we had a swarm in our backyard once. They are so intriguing to look at. Bees are just so clever and, of course, we would be lost without them. I heard on the ABC today that numbers are building up again thankfully. Aren't they amazing! The things I learned about how they manage themselves right from birth increased my admiration of the society within hives. Wow that's a huge swarm. What an interesting process, lucky you were able to watch it. It's sad that the ones left behind will die. It is sad Sami, I take peace from the fact the we saved the rest who may not have been able to find a suitable permanent site and ended up somewhere inappropriate, then ultimately ended by an exterminator. So beautiful, and what a pleasure to have this happen. Even more lovely is the opportunity to watch the process of nature coming into balance in the microcosm in your yard. The whole and cool cycle.